As part of the conflict matrix completion process, the RWGs were initially tasked with assigning a level of ‘use’ or ‘activity’ for each management zone within their estuary based on a four point score of 0 to 3 (see Appendices). These data have been analysed in the context of the salinity zones and provided in the following Figures (Figures 6-9), with the moderate and high use scores shown in orange and red respectively. For the limnetic zone (Figure 6), the three main sectors of high uses/concerns in the Humber were identified as relating to recreational access along the banks and intertidal zone; flood protection from flood bank (dyke/gabion/wall); and agricultural run-off. For the Elbe, two high scores were identified: flood protection from flood bank (dyke/gabion/wall);and vessel movement. For the Scheldt, five high scoring uses/concerns were identified: recreational access on water; recreational access along the banks and intertidal zone; commercial access; flood protection from flood bank (dyke/gabion/wall);and channel stabilisation for navigation. For the Weser high uses/concerns were identified as being: recreational access along the banks and intertidal zone; flood protection from flood bank (dyke/gabion/wall); channel stabilisation for navigation;and residential housing adjacent to the estuary. Based on the above, the limnetic zone featured three high scoring uses/issues in the Humber, with a total score for the zone of 40. For the Elbe, two high scoring uses/issues were identified, with a total score for that region of the estuary of 40, the same as the Humber. The Scheldt featured five high scoring uses/issues with again an overall score of 41 for the estuary zone being broadly comparable to those of the Humber and Elbe. However, whilst four high scoring uses/issues were identified, the overall score for the zone was considerably higher than the other estuaries (51). Only the use/issue of flood protection from flood bank (dyke/gabion/wall) was common across all estuaries as being afforded the highest score. 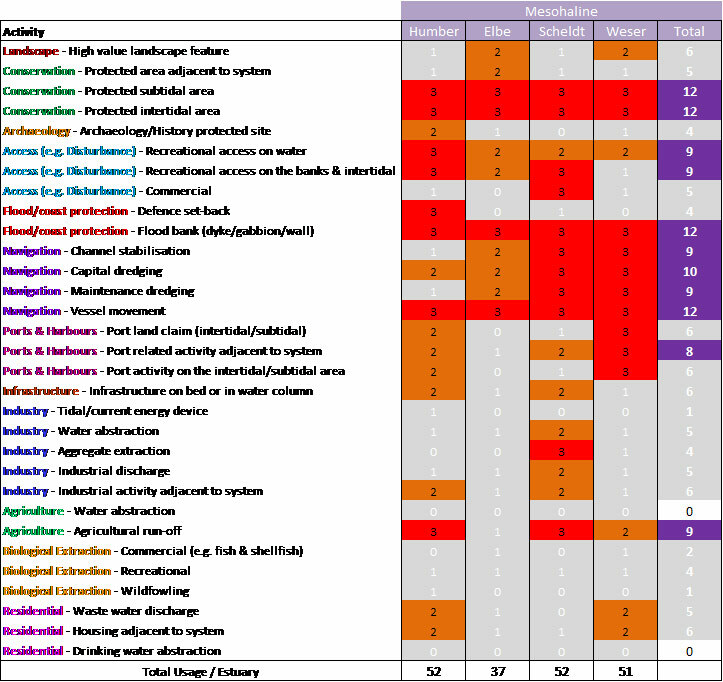 However, when all scores across the four TIDE estuaries are combined, then the following uses/issues were rated as a moderate/high combination (e.g. a score in excess of 8 from a maximum of 12), ranked from highest score downwards. 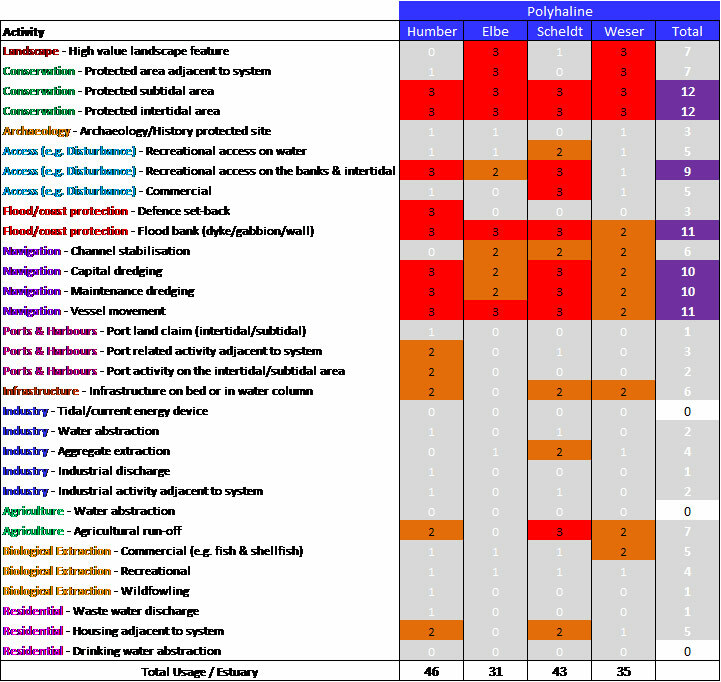 Further details of the uses/issues analysis for the limnetic zone are given below in Figure 6. Figure 6: Usage scores for the limnetic zones of each estuary and total activity per zone. Three high uses/issues scores were established for the oligohaline zone of the Humber, these being recreational access along the banks and intertidal zone; flood protection from flood bank (dyke/gabion/wall); and agricultural run-off. For the Elbe, six high scoring uses/issues were identified: protected areas for conservation adjacent to the system; protected areas for conservation in the subtidal; protected areas for conservation in the intertidal; recreational access on water; flood protection from flood bank (dyke/gabion/wall);and vessel movement. On the Scheldt, 11 high scoring uses/issues were noted: protected areas for conservation adjacent to the system; protected areas for conservation in the subtidal; protected areas for conservation in the intertidal; recreational access on water; recreational access along the banks and intertidal zone; commercial access; flood defence set-back; flood protection from flood bank (dyke/gabion/wall); channel stabilisation for navigation; vessel movement;and residential housing adjacent to the estuary. The Weser group rated five high scoring uses/issues from the oligohaline zone: protected areas for conservation in the subtidal; protected areas for conservation in the intertidal; flood protection from flood bank (dyke/gabion/wall); channel stabilisation for navigation; and agricultural run-off. Based on the above, the oligohaline zone featured three high scoring uses/issues in the Humber, with a total score for the zone of 40. For the Elbe, six high scoring uses/issues were identified, but with a total score of 38. The Scheldt featured 11 high scoring uses/issues unsurprisingly giving a total score for the zone of 55, the highest individual zone score for any estuary and zone from the analysis. The Weser featured five high scoring uses/issues with a total usage score of 45. As with the limnetic zone, only the use/issue of flood protection from flood bank (dyke/gabion/wall) was common across all estuaries as being afforded the highest score. However, when all scores across the four TIDE estuaries are combined, then the following uses/issues were rated as a moderate/high combination (e.g. a score in excess of 8 from a maximum of 12), ranked from highest score downwards. Of note, tidal or current energy device deployment was identified as not being a use/issue in any of the estuaries in this zone. Further details of the uses/issues analysis for the oligohaline zone are given below in Figure 7. 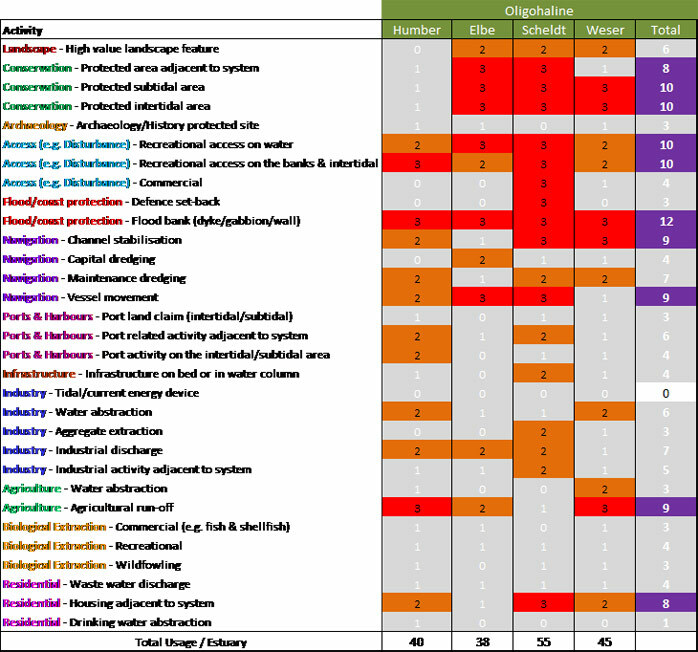 Figure 7: Usage scores for the oligohaline zones of each estuary and total activity per zone. Eight high level uses/issues scores were established for the mesohaline zone of the Humber, these being: protected areas for conservation in the subtidal; protected areas for conservation in the intertidal; recreational access on water; recreational access along the banks and intertidal zone; flood defence set-back; flood protection from flood bank (dyke/gabion/wall); vessel movement;and agricultural run-off. For the Elbe, four high scoring uses/issues were identified: protected areas for conservation in the subtidal; protected areas for conservation in the intertidal; flood protection from flood bank (dyke/gabion/wall);and vessel movement. On the Scheldt, 11 high scoring uses/issues were again noted, in this zone being: protected areas for conservation in the subtidal; protected areas for conservation in the intertidal; recreational access along the banks and intertidal zone; commercial access; flood protection from flood bank (dyke/gabion/wall); channel stabilisation for navigation; capital dredging; maintenance dredging for navigation; vessel movement; aggregate extraction;and agricultural run-off. The Weser group rated 10 high scoring uses/issues: protected areas for conservation in the subtidal; protected areas for conservation in the intertidal; flood protection from flood bank (dyke/gabion/wall); channel stabilisation for navigation; capital dredging; maintenance dredging for navigation; vessel movement; port land claim; port related activity adjacent to the estuary;and port activity on the intertidal and subtidal. Based on the above, the mesohaline zone featured eight high scoring uses/issues in the Humber, with a total score for the zone of 52. For the Elbe, four high scoring uses/issues were identified, with a total score of 37. The Scheldt again featured 11 high scoring uses/issues giving a total score for the zone of 52, and the Weser featured 10 high scoring uses/issues with a total usage score of 51. In the mesohaline zone, the categories of: protected areas for conservation in the subtidal; protected areas for conservation in the intertidal; flood protection from flood bank (dyke/gabion/wall); and vessel movement were afforded the highest score across all estuaries. Combining all estuary scores for the zone then identifies the following uses/issues as being rated as a moderate/high combination (e.g. a score in excess of 8 from a maximum of 12), ranked from highest score downwards. Water abstraction for agricultural use and water abstraction for residential use were identified as not being present as a use/issue in any of the estuaries in this zone. Further details of the uses/issues analysis for the mesohaline zone are given below in Figure 8. Figure 8: Usage scores for the mesohaline zones of each estuary and total activity per zone. Within the Humber, eight high level uses/issues scores were identified for the polyhaline zone, these being: protected areas for conservation in the subtidal; protected areas for conservation in the intertidal; recreational access along the banks and intertidal zone; flood defence set-back; flood protection from flood bank (dyke/gabion/wall); capital dredging; maintenance dredging for navigation;and vessel movement. For the Elbe, six high scoring uses/issues were identified: high value landscape; protected areas for conservation adjacent to the system; protected areas for conservation in the subtidal; protected areas for conservation in the intertidal; flood protection from flood bank (dyke/gabion/wall);and vessel movement. On the Scheldt, nine high scoring uses/issues were noted, they being: protected areas for conservation in the subtidal; protected areas for conservation in the intertidal; recreational access along the banks and intertidal zone; commercial access; flood protection from flood bank (dyke/gabion/wall); capital dredging; maintenance dredging for navigation; vessel movement;and agricultural run-off. The Weser group scored four of the uses/issues as high scoring in the polyhaline zone: high value landscape; protected areas for conservation adjacent to the system; protected areas for conservation in the subtidal;and protected areas for conservation in the intertidal. Based on the above, the polyhaline zone featured eight high scoring uses/issues in the Humber, with a total score for the zone of 46, whilst for the Elbe, six high scoring uses/issues were identified, with a total score of 31. The Scheldt featured nine high scoring uses/issues giving a total score for the zone of 43, and the Weser featured 4 high scoring uses/issues with a total usage score of 35. In the polyhaline zone, the categories of protected areas for conservation in the subtidal,and protected areas for conservation in the intertidal were afforded the highest score across all estuaries. By combining all estuary scores for the zone then the following uses/issues can be rated as a moderate/high combination (e.g. a score in excess of 8 from a maximum of 12), ranked from highest score downwards. Tidal and wave energy devices, water abstraction for agricultural use, and water abstraction for residential use were identified as not being present as a use/issue in any of the estuaries in this zone. 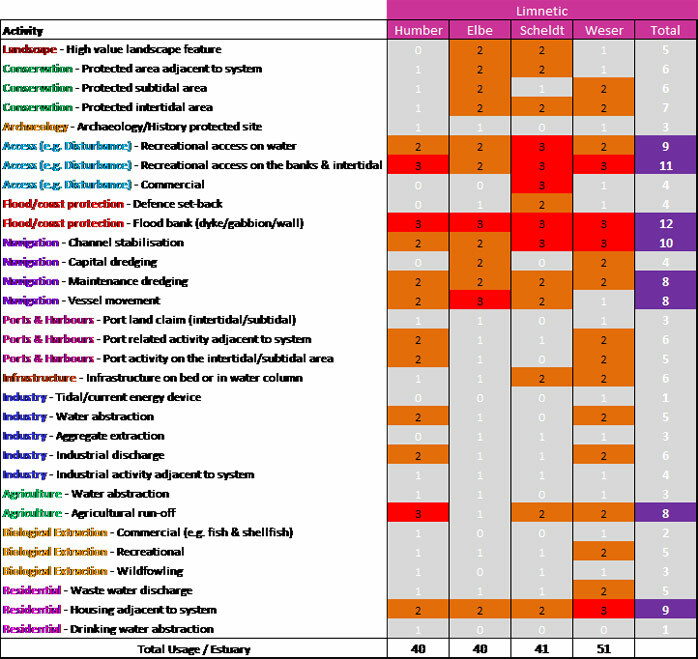 Further details of the uses/issues analysis for the mesohaline zone are given below in Figure 9. Figure 9: Usage scores for the polyhaline zones of each estuary and total activity per zone. Figure 10 summarises the uses/issues scores for each estuary and zone, as well as for all estuaries combined. This indicates that for all of the TIDE estuaries combined, the zone with the greatest uses/issues is the mesohaline zone and with the polyhaline zone featuring the lowest uses/issues (at c. 80% of the level identified in the mesohaline). Across all of the TIDE estuaries, the greatest level of uses/issues was identified for the Scheldt estuary, with the Elbe featuring the lowest score (c. 75% of the score for the Scheldt). The Elbe and the Weser recorded the highest individual uses/issues scores in the limnetic zone, although for the Weser, the same score was also recorded from the mesohaline zone. The Scheldt recorded the highest uses/issues score in the oligohaline, with the Humber peak occurring from the mesohaline zone. 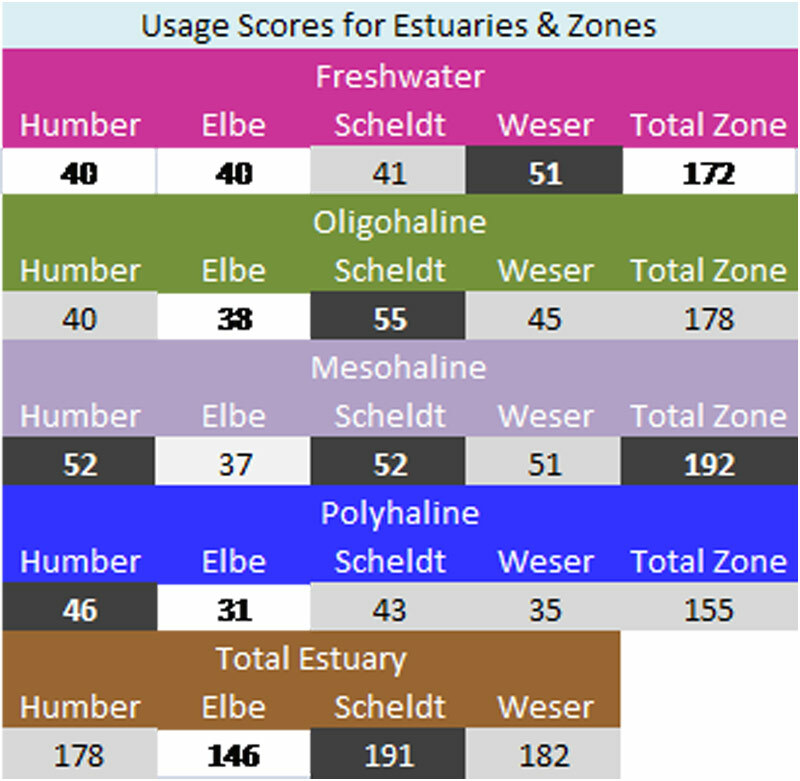 Figure 10: Summary of uses/issues scores for each estuary zone and for all estuaries combined (maximum usage scores for each estuary shown in darker grey). Relative proportion of salinity zones within each estuary varies, with the Humber being most atypical with a much reduced limnetic zone.